Can any party go without a nice dose of drama on TV? 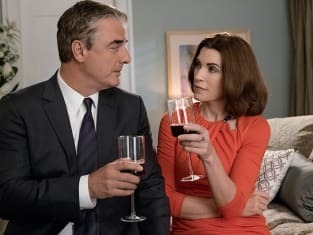 On The Good Wife Season 7 Episode 20, Alicia threw a party for Howard and Jackie's wedding, but things went from bad to worse when an uninvited guest showed up with the intention of wreaking havoc. Elsewhere on this soon to be defunct drama, Eli asked Jason to to investigate Peter before in preparation for his trial, but what did he find out? How will it affect that the case against him? Use the video above to watch The Good Wife online to get up to date with all the latest.